NEW!! 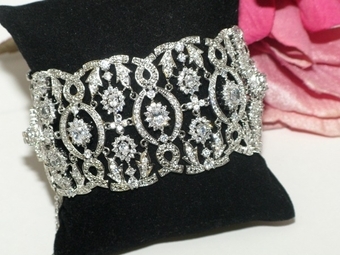 Isadora - HIGH END Vintage CZ bridal bracelet -AMAZING PRICE!! HOME / BRIDAL JEWELRY / Wedding Bracelets / NEW!! Isadora - HIGH END Vintage CZ bridal bracelet -AMAZING PRICE!! Vintage style filigree wide clasp closure wedding CZ bracelet. measures approximately 2 1/4" wide, fits small to average wrist size.